A square room with the bar taking one quarter leaving an L-shaped space. Met a guy here who was from near Den Helder and said Anytime is the best. Malin from Norway. Sent 1 Jul 2011. Visited several times as both the weed and hash were great! The people working there were really nice and made you feel welcome. They have a smoking booth for those who want to use tobacco in their weed/hash and another room for vaporizing. Tony from Canada. Sent 30 Oct 2007. Very friendly service. Has 5 or 6 tables to sit down at. The employees made sure stems were removed before weighing, which was nice as I have noticed some shops don't. Can still buy Northern Light Special for € 10. Great place! Mark & Russell from Scotland. Sent 15 Jan 2005. We were in Alkmaar in December 04 for a UEFA cup tie against AZ Alkmaar and were looking to sit and enjoy a smoke in different surroundings as we usually go only to Amsterdam. A local resident directed us to Anytime coffeeshop and advised us it was the best one in town. I have to say it was a very pleasing experience, the staff were extremely friendly and made us feel instantly welcome. The smoke was of a very good quality, we sampled Peacemaker & E.T. (grass) and also the light Moroccan 11 Euro for 5 grams, great value for money as were the drinks, 50 cent. After a short while the guys working there introduced us to the house vaporiser, wow, probably the highest we have ever been, what a buzz, we were also encouraged to use it as often as we liked, which was pleasing. We spent a good three or four hours in Anytime which tells you we had an excellent time and whenever I go back to the Netherlands I shall be looking to visit this coffeeshop, 5 stars. Robbie from Netherlands. Sent 23 Dec 2004. Ask for the Northern Light Special. Really the best of them all. Don't believe me? Buy a little bag from € 10,- and you will see! Dj_necratog from Netherlands. Sent 22 Nov 2004. 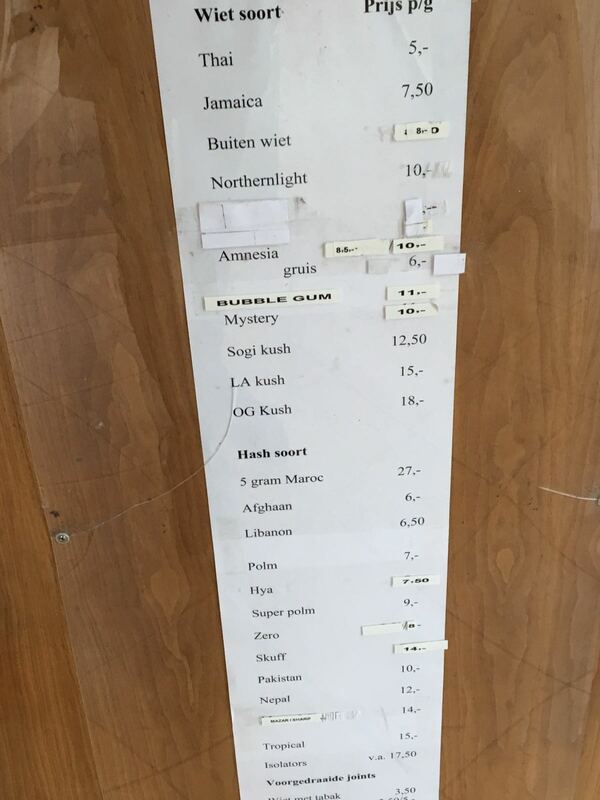 Good shop, but the quality of the weed may vary from time to time (can park in front of door). Pieter from Netherlands. Sent 15 Apr 2003. Coffeeshop Anytime in Alkmaar has moved from the "Bergerweg" to the "Laat". Unfortunately I do not know the housenumber, but it is a neighbour of ZeroZero.